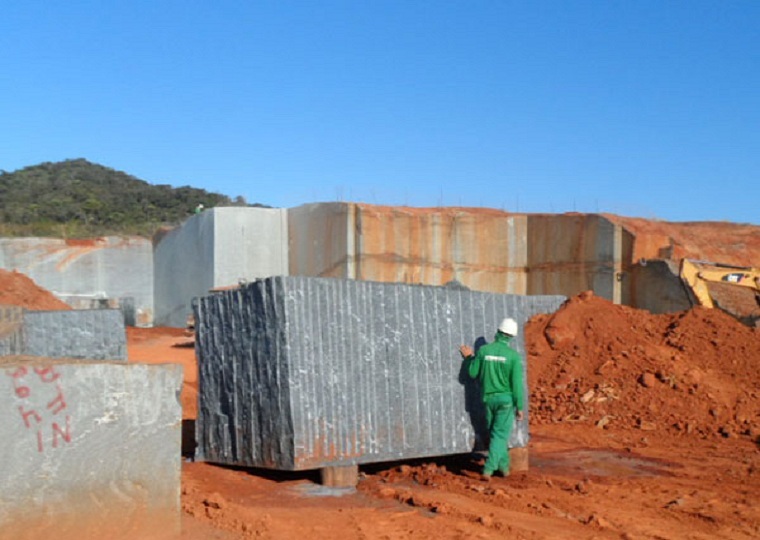 Brazil is the second largest exporter of Granite Blocks and Slabs in the world. The 2017 statistics confirm that China’s market is a key factor in Brazil’s export performance. 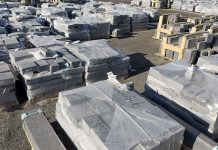 Stonenews.eu, following a survey of the International Trade Center and National Statistical Service statistics, shows the growth in Brazilian Granite Blocks and Slabs exports between 2016 and 2017 and its 2017 value and quantity shares. Exports of Brazilian Granite Blocks and Slabs until 2013, where they achieved a record high in value and quantity of exports, were constantly growing mainly due to the rapid increase in exports to China. In 2001, China’s share of total exports of Brazilian Granite Blocks and Slabs was 13%, while in 2017 it stood at 64.81%. It is clear that China monopolizes Brazilian exports by determining, on account of their size, the total exports of Granite Blocks and Slabs. 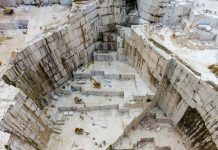 In 2017, Brazil exported Granite Blocks and Slabs with a lower price per tonne by 1,32% compared to 2016. Decline was also noted in the total value of exports by 5.93% and in the quantity by 4.67%. with a lower price per tonne by 1,32% compared to 2016. 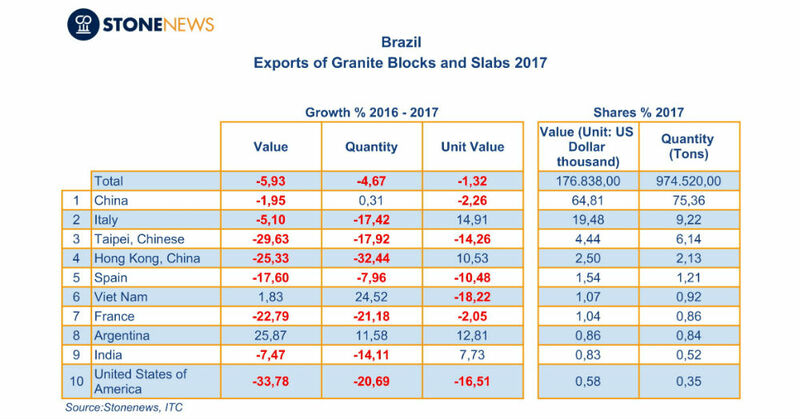 In the following table we can see the top ten destinations of Brazilian Granite Blocks and Slabs, according to the 2017 export value shares. As we can see in the Table, in 2017, Brazil exported Granite Blocks and Slabs with a higher price per tonne than in 2016 in Italy by 14.91%, in Argentina by 12.81%, in Hong Kong by 10.53% and in India 7.73%. On the contrary, it exported in a lower price per tonne to Vietnam by -18.22%, the US by -16.51%, Chinese Taipei by -14.26%, Spain by -10.48%, China by -2.26% and France by -2.05%. 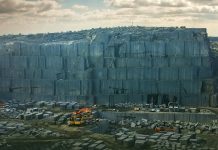 In 2017, Brazil exported Granite Blocks and Slabs in 39 countries. 95.5% of the export value was made under HS Code 251612 * and the remaining 4.5% under 251611*.